SINGAPORE - The historic summit between US President Donald Trump and North Korean leader Kim Jong Un will be held at the Capella Hotel on Singapore's resort island of Sentosa, the White House has announced. White House press secretary Sarah Huckabee Sanders confirmed the venue for the June 12 meeting, which will take place at 9am, in a tweet on Tuesday (June 5, US time). "We thank our great Singaporean hosts for their hospitality," she added. The restored hotel, which sits in the middle of 12ha of lawns and rainforest, had been identified as a possible location in the run-up to the summit. The US delegation had earlier been based at the hotel during talks in Singapore last week with Mr Kim Chang Son, the de facto chief of staff for the North Korean government, to work out logistics for the summit. The hotel, designed by renowned British architect Norman Foster, has 111 guestrooms and a presidential manor. It is owned by the Kwee family of Pontiac Land Group. The hotel location is secluded and private, which experts say could be a key consideration for security-conscious US and North Korea. It is also minutes away from the Central Business District by car. 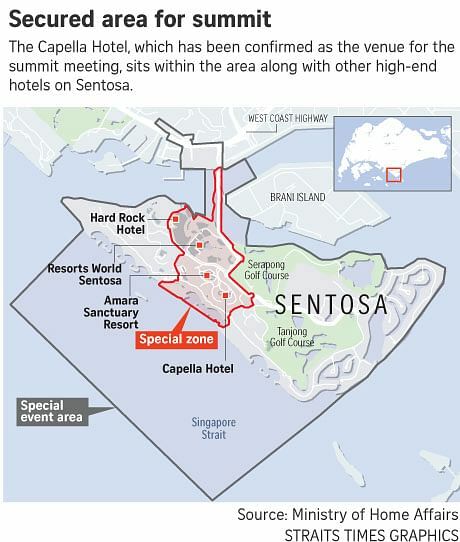 The White House announcement came hours after the Singapore authorities declared Sentosa a "special event area" for the summit. In an order made on Tuesday in the Government Gazette under the Public Order Act, the "special event area", which comprises all of Sentosa Island as well as waters off its south-west beaches, will take effect from June 10 and run to June 14. The Government had also announced earlier that it gazetted as a "special event area" the Tanglin area surrounding the Shangri-La Hotel, which similarly had been tipped as a likely venue for the summit. The move imposes restrictions to certain activities within the delineated areas. People and vehicles who enter this area will see stricter security measures and may be subject to spot checks. These include bag and body checks. They may be asked to produce identification details. Drones and items such as flags, banners, signal flares and flammable materials will also not be allowed within the area. In another order made on Tuesday, the Government also declared that four vehicles will be exempted from certain traffic rules until June 30. Checks by The Straits Times show that all four vehicles are black 7-series BMWs. The exemptions for the vehicle includes rules governing speed regulations, seat belt requirements and the use of lamps or lights. The exemption will take effect from the period of June 3 to 30, for the purposes of training or for conveying "non-citizen" individuals who take part in the summit or its related activities around Singapore, said the order.